Photo provided by Rossdale Regeneration Group. EPCOR decommissioned the Rossdale power plant in 2011 and handed it over to the City not long after I moved here. Like many new Edmontonians with jobs, young families, snow to shovel and lawns to mow, I hardly had time to contemplate my navel let alone the city’s struggles to balance the past with the future. Luckily I am now paid to do just that – contemplate the city’s history and the importance of heritage for citizens (not navel gazing). And with the City’s Executive Council about to review a major report on the future of the Rossdale site, I thought this would be a great opportunity to turn my focus to this fascinating heritage question. I had not heard of the Rossdale site before stepping into my role as Historian Laureate, but it immediately grabbed my attention. It is a perfect case study for the tensions at play in the development (or redevelopment) of the city. Rossdale shows the tight balancing act City administration is trying to walk between economic growth, heritage preservation, and ecological sustainability. The site is also important – some say sacred – to indigenous peoples and others in the city because of the cemetery on one corner of the property. Many local Cree know the site as Pehonan, which artist and scholar Louis Buff Parry elegantly notes is a verb (rather than a noun) meaning “waiting place”. It was a traditional site used by indigenous peoples going back over 5,500 years, and then the location of the first Fort Edmonton. It was also at this place – then called the Edmonton Exhibition – that Prime Minister Sir Wilfred Laurier declared Alberta a new province in 1905. 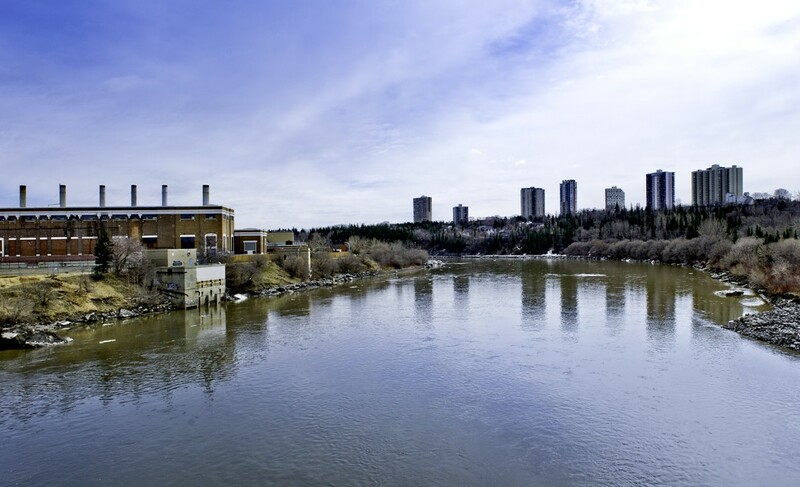 After 1909, the Rossdale Flats became the site of waterworks, and a power generating station, and a sewage treatment plant. Like any contentious physical site, Rossdale has become a place for people to project their values. Some have suggested it be left to decay “organically” as an urban ruin, a modern-day Roman Coliseum. Others would turn it into high-income condos with a man-made canal or possibly create a funicular up the hill to the tune of $80 million. Then there are those, such as the Spirit of Edmonton alliance, who advocate that Rossdale become part of an Indigenous cultural and natural history trail that would stretch from the Shaw Conference Centre down to Fort Edmonton Park’s proposed Indigenous Peoples Experience. The Rossdale site itself would host a (non-public art) fountain in honour of Louise Umphreville, the formidable Métis wife of Fort Edmonton’s Chief Factor John Rowand, as well as an Indigenous Centre for Art and Knowledge. Rossdale is a perfect test case for future development, and hopefully, will set a high bar for Edmontonians as they look around at the challenges and opportunities facing our city. I for one, am optimistic. A couple of years ago, Calder Batemen Communications was hired by the City to figure out what people thought about the future of the Rossdale site. The company pulled together four focus groups (including one made up entirely of indigenous participants), and they all zeroed in on sustainability, accessibility (both physically and financially), and cultural and historic sensitivity. In essence, they were talking about a Triple Bottom Line proposal à la Arlene Dickinson on Dragon’s Den – a bottom line that goes beyond just profit to include people and the planet. Although in this case, Edmontonians (I am happy to report) want to include a fourth “P”: the past. Renfrew Ball Park, circa 1979, on the site of Telus Field. Taken from AGT Vista 33 (now TELUS Plaza). Courtesy of Roland Bressmer. At a Creative Mornings talk I gave last year, I said that there are no right answers when it comes to heritage, only those we can live with. In many ways, discussions around the Rossdale site and city development and heritage preservation generally, are like Conflict Resolution 101. How do we make the consultation process fair and the end result agreeable to as many people as possible? We also need to do some self-reflection about our positions and own up to our cultural baggage. For example, I am a middle-class, bicultural Caucasian woman at the upper end of the millennial range who happens to really like arts, heritage, café culture, and microbrews. I also have a young, active son, live in the suburbs and like to bike and run (well, the second one is a bit of a stretch sometimes). So when I read about a multi-use, year-round site that features a skating rink/wading pool, riverside promenade, rooftop restaurant, cooperative microbrewery, and flexible interior programming space that could host everything from art shows to theatre performances, I get a little excited. Give me a permanent Indigenous Arts and Culture Centre along with space for a City Museum, and I’m sold. From what I’ve read of the various proposals and what I have experienced in similarly reimagined industrial buildings in other parts of Canada and the world, I see a chance to create the “new kind of power plant that produces ideas, innovation and inspiration,” outlined by the focus groups. I also see a perfect opportunity to honour the spirit of Pehonan and incorporate the Spirit of Edmonton proposal. According to their document, “The pehonan was a place where the people honoured and respected each other while waiting for trade, ceremony, and celebration. A place where a diversity of nations once gathered.” This is the community I envision and the legacy I would like to leave – preferably with a cool microbrewed beer in hand to toast our collective future. Linda Goyette, Carolina Jakeway Roemmich, Edmonton in our Own Words (University of Alberta, 2005).